That's how it can feel with Asthma. But, if you are having an Asthma attack, you don't just lose your breathe for a moment. There are Asthma triggers which can be different for each person. Some of the triggers include smoke, dust, dander, mold and environmental air quality. We are all exposed to these triggers almost daily -not all, but most of them. Which is why raising Asthma Awareness is so important and if you're going to raise awareness -why not do it beautifully?! With this gemstone bracelet raising awareness of Asthma has never been so beautiful. This handmade beaded awareness bracelet features stunning faceted labradorite rondelle gemstones flanking the center and sides with sterling silver beads, Bali and black diamond Swarovski Crystals intermingled into the design. Finished with a sterling silver awareness ribbon charm and signature jewelry tag. Measures 8". The uniqueness of these natural labradorite gemstone beads is the grey base displays flashes of brilliant blue, purple and green colors! Gray is nationally recognized as the Asthma Awareness ribbon color and Allergy Awareness color. 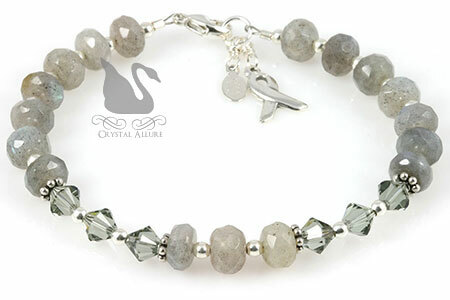 As a healing crystal, labradorite strengthens the immune system and repairs the aura. 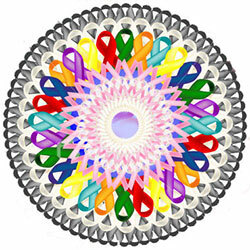 The following is a comprehensive guide of awareness ribbon colors and their associated cause(s). Use this guide to discover the cause(s) associated with a specific color of awareness ribbon. This extensive list has been an internet-wide reference tool for ribbon cause colors since 2004. Many groups have adopted color ribbons as symbols of support or awareness, and as a result, many causes often share the same color. 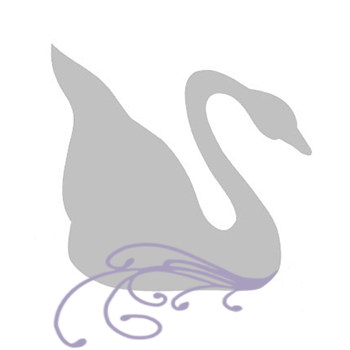 As well, there may be more than one color associated with a cause, in which case, it is up to you on your ribbon color preference in support of that cause. If you did not find the ribbon color or corresponding cause you were looking for, please contact me. Or you may wish to search for your ribbon color by cause, using our alphabetical Awareness Colors and Meanings guide. Feel free to contact me about a custom awareness bracelet design or cause jewelry. This exclusive handmade beaded bracelet was first introduced back in 2009 and has been very popular style. As it should be. This awareness bracelet is a symbol of Hope and a source of Awareness for Organ Donation and Transplant. This is a Crystal Allure Creations exclusive and original design. 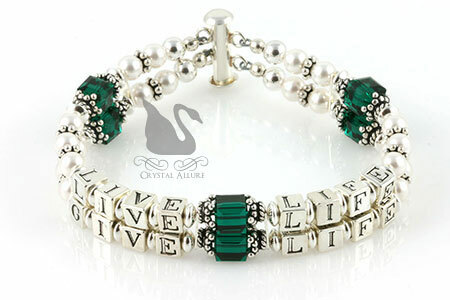 Two strands of sparkling sterling silver accented with .925 Bali, green emerald Swarovski Crystal cubes, white Swarovski pearls bearing the message "Life Life, Give Life" in sterling silver alphabet beads. Finished with a sterling silver slide clasp this cuff bracelet measures 7-1/2". This bracelet is MADE TO ORDER. Please contact me for availability and/or customization. Now available in limited quantities are these affordable add-a-bead charm bangle bracelets. They give you a designer look that is much more budget friendly than the more expensive European style charm bracelets and beads (hint....the designer starts with a "P"). These bead charm bracelets feature European large-hole style beads on an adjustable 7"-8" sterling silver bangle cuff. Beads will float along the bangle bracelet with your arm movements. 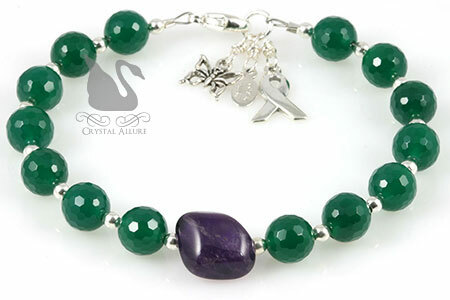 The first of these great starter charm bracelets is the Add A Bead Purple Charm Bangle Bracelet (B209-P). Any large-hole bead(s) easily slide onto the bangle by unscrewing one ball end. Personalize your bracelet even more by interchanging your bead selection with your favorite 4-4.5mm large-hole charm beads to truly make this your own designer charm bracelet. This beautiful shade of topaz brown is also the awareness color for: Anti-Tobacco, Colon Cancer, Colorectal Cancer, Familial Polyposis, Great American Smokeout, Tobacco Awareness. Request a sterling silver awareness ribbon charm and you've instantly created a beautifully unique awareness charm bracelet! If you would like to customize these bangle charm bracelets, simply contact me to discuss options. The last in this European Style Bracelet series is the stunning and classic Add A Bead Blue Charm Bangle Bracelet (B209-B). Any one of these lovely neutral color charm bracelets would complement your daily wardrobe and they are super easy to put on -just grab and go! Personally, I feel there is an element of romance that comes with stained glass. Stained glass, or colored glass, is both an art and a craft. It takes skill to produce a beautiful workable design and then it takes skill to assemble the piece. You might be most familiar with the beautiful and stunning stained glass found in church windows. A fond memory I have as a child was walking to church and being so mesmerized with the awe-inspiring stained glass windows at St. Stanislaus Kostka Church. 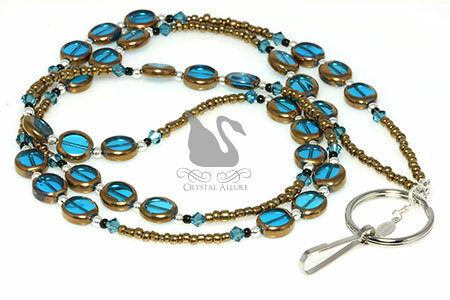 That fond memory is what inspired this beautiful Blue Stained Glass Crystal Beaded ID Lanyard (L107). The pairing of a rich blue "stained glass" bead with bronze seed beads makes the ID Badge Holder a standout piece! Show your ID in style with this beautiful handmade beaded lanyard. Design features aqua blue "stained glass" beads, bronzed and black seed beads, sterling silver and blue indicolite Crystals by Swarovski. The badge holder comes with a 24mm silver key ring, lanyard hook and is finished with our sterling silver jewelry tag. Total length is 35" and hangs 17-1/2" long from your neck (including key ring and badge hook). This bead lanyard is Made in the USA and is a necessity of you have to wear a work badge, have to show your badge for access points, carrying keys and more. It will also make for a useful and thoughtful handmade to your coworker or as gifts from boss to staff! *Contact Us to check availability of inventory and whether this lanyard can be recreated. At a recent show, while discussing one of my handmade beaded jewelry designs with a customer, the question was asked, "What is the difference between gold plated and gold filled metal?" 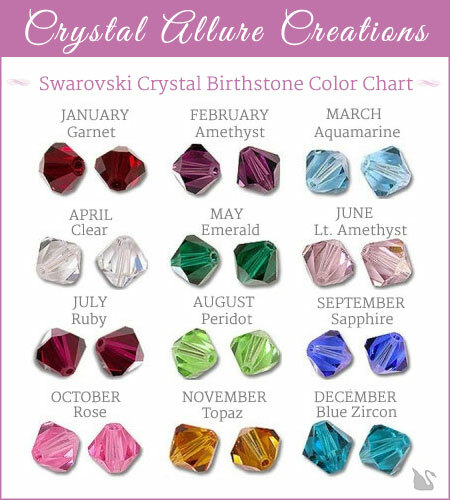 After explaining the difference to her, I thought this topic would make a great jewelry article to share for general knowledge purposes, especially if you are looking to purchase handmade jewelry. Each jewelry designer has his/her own preference of metal they like to use in their jewelry designs and some will even mix metals, making the design even more unique. There really is no one good metal over another, in terms of the design itself. The choice of metal used in a design really depends on the purpose and interpretation of the jewelry piece, the designers preference, and at times, cost. It's a pretty simple equation, the better the metal, the more cost involved. For many people, wearing a piece of jewelry made with pewter components as opposed to sterling silver, makes no difference. For them, it's really about the design of the piece and how it makes them feel. Although for others, the wearing of non-precious metals can cause skin irritation and/or a rash. This group of shoppers will naturally prefer a precious metal such as sterling silver or 14 karat gold. Below is an outline of some of the more common gold metals used in handmade jewelry design, ranging from fine jewelry to fashion jewelry. At Crystal Allure Beaded Jewelry, I have worked with a few different metals throughout the years and although I have no particular preference of one over the other, my unique handmade designs currently showcase either sterling silver, 14 karat gold-fill and/or vermeil (pronounced vehr-MAY). GOLD - A precious metal that does not oxidize or tarnish as most other metals do. 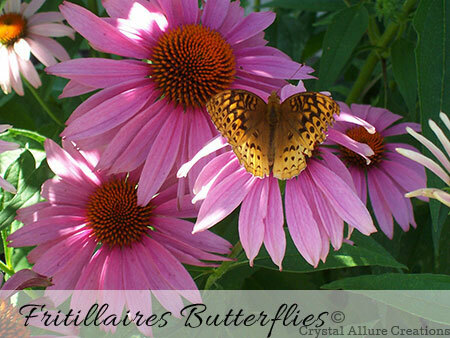 It has been used for over 6000 years in coins, jewelry and ornamental objects. Gold is very malleable and can be melted and cast into both small and large objects. It is also forged into very thin sheets called gold leaf and used to cover the surface of less valuable ornaments. Gold is alloyed with other metals like silver, copper or nickel to make it harder. The ratio of gold to other metals is what denotes the karat content. Common gold alloys are made by mixing gold, silver, copper, and/or other metals to produce 14K, 18K and 22K gold, white gold (gold and nickel or palladium), rose gold (gold and copper), green gold (gold with silver or silver and cadmium) , and blue gold (a recent gold color perfected by only a few jewelers). Example: 14kt-by weight 14 parts gold to 10 parts other metals, or 58.33% pure gold. VERMEIL -(pronounced vehr-MAY) is a process that combines precious metals to produce semi-fine quality jewelry. The inside core is .925 sterling silver, the outside is a thin coating of 14 karat gold plate. Where the gold plating has not completely bonded with the sterling silver, the silver will eventually tarnish. Therefore, overtime, expect vermeil to darken slightly with age. Since vermeil is electro-plated, not fused like gold-filled, the plating will eventually wear off. This usually happens in a year or two. It takes longer to wear off than costume gold-plate because the plating on vermeil is considerably thicker than that on costume jewelry. The combination of metals in vermeil produces jewelry that looks and feels like pure gold. GOLD FILL - (also called "gold overlay" and "rolled gold") Gold fill beads are made by applying a layer of gold, using heat and pressure to permanently bond the gold, to a core of brass or other base metal. This produces a much thicker surface of gold than gold plating. The minimum layer of karat gold must equal at least 1/20th of the total weight of the item. Use care when buffing gold fill beads and components to avoid removing the gold layer. When a company is manufacturing gold-filled beads and components, it is their choice as to how thick a layer of gold to place over the base metal material. Thus, you can have two gold-filled pieces and you may have the gold layer wear off more quickly on one piece than the other. It is difficult, unfortunately, to be able to tell whether the purchase price of any piece reflects its true value. Sometimes, you will see a notation next to the Gold-Filled label indicating the relationship between the weight of karat-gold and the weight of the brass core material. For example, if you see the notion "14/20 Gold-Filled" this means that the piece is 1/20th 14 karat gold. The 1/20 notation refers to the ratio of the 14 karat gold layer to the brass layer by weight, which is 5%. What is important here to the jewelry designer is less the content of gold, but rather more the color of the gold-filled piece. 14/20 gold fill will be more golden, darker, mellow; whereas, 12/20 gold fill will be brighter, brassier, yellower. First, Gold Fill is less expensive than pure Gold - making jewelry more affordable. Second, of the alternatives (Gold Plate or Gold Vermeil), Gold Fill will not tarnish, turn green, or wear off and can be worn as "every-day" jewelry. In any case, gold-filled is a much more durable product than gold-plate or vermeil. Gold-filled jewelry is economical, and enjoys the rich look of gold at a fraction of the cost. GOLD PLATE - Gold plating is a method of depositing a thin layer of gold on the surface of other metal, most often copper or silver but can be brass as well, usually by electroplating or an electrochemical process. A second chemical is used as a finishing to give the color a "brightness". The gold color and brightness wears off pretty quickly, much more quickly than gold filled, when interacting with the wearer's skin salts or the pollutants in the air. On an average person in an average environment, the brightness finish fades in about 3-6 months, and the color fades in 6 months to a year. If the environment is very humid or very polluted, this can happen much more quickly. Some people have either ammonia's or sulphides in their sweat. These chemicals dissolve one or both of the chemicals in the plating and/or finishing. However, if you are on a handmade jewelry budget, or just want to experiment it’s the perfect metal to work or start with!